FCPO June Futures contract traded RM15 higher as compare to previous trading sessions to close at RM2575 with a total of 7,328 lots traded in the market. FCPO price higher during trading session as crude oil and soybean oil were traded higher during electronic trading despite were traded weak during overnight trading. FCPO price seems holding above support levels at RM2554; 61.8% Fibonacci support levels despite few attempts to penetrate resistance levels at RM2600 failed. Technically, FCPO price seem temporary holding above support levels at RM2554 and RM2540 regions while attempt to penetrate resistance levels at RM2600 in order test next nearest resistance levels at RM2616 and RM2645 region; both 61.8% and 78.6% Fibonacci resistance levels. FKLI March Futures contract was traded 4.5 point higher as compare to previous trading session to close at 1317.5 levels with a total of 4,465 lots traded in the market. FKLI was traded sideways during entire trading session as regional indices were traded mix during trading hours. 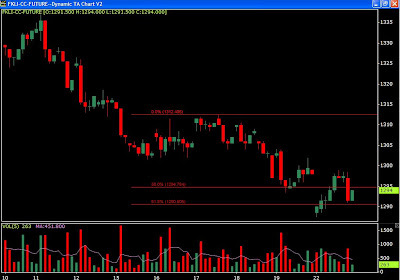 FKLI was traded within tight range from 1313 to 1317 during entire trading session. Technically, FKLI still attempt to challenge resistance levels at 1318 and 1326; 61.8% and 78.6% Fibonacci resistance levels in order to reverse towards bull trend. However, in the event if FKLI manage to surge higher, support levels at 1304 and 1300 must not be penetrate in order for bull market to resume. FCPO June Futures contract traded RM31 lower as compare to previous trading sessions to close at RM2560 with a total of 9,675 lots traded in the market. FCPO price plunge lower during trading session as soybean oil and crude oil electronic trading were trade south during trading sessions while CPO price might pessimistic on the coming ITS and SGS export figure. FCPO price fails to penetrate resistance level RM2600 regions after 4th attempt in the hourly price before begin to plunge lower during trading sessions. Technically, FCPO price seem temporary support above support levels at RM2554 and RM2542; 61.8% and 78.6% Fibonacci support levels during FCPO price were traded weak. However, FCPO price would indicate further trading south provided support levels at RM2520 fails to hold against the selling pressure in the coming trading sessions. 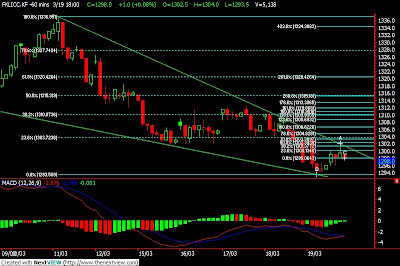 Resistance levels were seen at RM2570 and RM2600 regions. FKLI March Futures contract was traded 1 point higher as compare to previous trading session to close at 1313 levels with a total of 5,578 lots traded in the market. FKLI encounter some profit taking activity during trading sessions as it was opened higher but traded lower during trading sessions. FKLI slower it’s speed on upsurge after encounter resistance levels at 1318; 61.8% and 223.6% Fibonacci resistance levels. Technically, FKLI would seen continue traded lower in the coming trading sessions provided resistance levels at 1318 and 1326.5; 61.8% and 78.6% Fibonacci resistance levels, were not violated in the coming trading session. However, support levels were seen at 1308 and 1304 region; 38.2% and 50% Fibonacci support levels, must be penetrated in the coming trading session in order for correction phase to resume. FCPO 3rd month June futures contract traded RM21 higher to close at RM2591 levels as compare to previous trading sessions with a total of 6,978 lots traded in the market. FCPO price attempted to penetrate psychology levels at RM2600 during trading sessions as crude oil and soybean oil were trade firm during overnight trading. FCPO price plunge lower towards support levels at RM2570 regions after attempt to breach resistance levels at RM2595; 78.6% Fibonacci resistance levels. Technically, FCPO price seems temporary holding above support levels at RM2570 and RM2550 regions while trading within a uptrend channel. FCPO price would resume into correction phase provided support levels fails to hold against the selling pressure while upside trading sees resistance levels at RM2606 and RM2646 regions; both are 50% and 78.6% Fibonacci resistance levels. FKLI Mar Futures contract traded 18 point higher to close at 1312 levels as compare to previous trading session to with a total of 5,689 lots traded in the market. FKLI was opened and traded higher during trading session despite most of the regional indices were traded weak during trading sessions. FKLI penetrate previous resistance levels at 1299 and surge to meet next nearest resistance levels at 1312.5; 50% Fibonacci resistance levels, after 1307 resistance levels fails to hold against the buying interest. 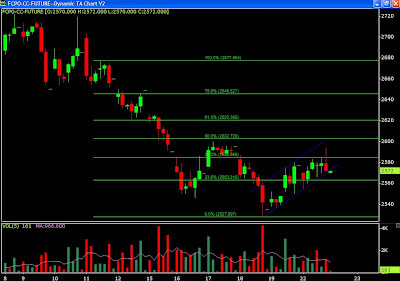 Technically, FKLI seem traded fiercely towards north but ended the sessions at 1312; 178.6% and 50% Fibonacci resistance levels while next nearest resistance level seen at 1326; 78.6% Fibonacci resistance levels. FKLI would remain trading on correction provided resistance levels were not violated during trading session while further confirmation once support levels at 1304.5 and 1291 fails to hold in the coming trading sessions. FCPO June Futures contract traded RM5 lower as compare to previous trading sessions to close at RM2572 with a total of 7,245 lots traded in the market. FCPO price was traded sideways towards north during trading sessions as soybean oil and crude oil were traded with contradicting direction while export figure show unfavorable demand on CPO supply. FCPO price penetrate resistance levels at RM2580 levels while trading within uptrend channel which form a flag formation in the hourly price chart. Technically, FCPO price would trigger sell signal provided support levels at RM2566 and RM2541 were violated in the coming trading sessions. However, FCPO price would trigger short term buying interest provided resistance levels at RM2602 and RM2620 fail to resistance the upwards trading. FKLI March Futures contract was traded 4 points lower as compare to previous trading session to close at 1294 levels with a total of 5,156 lots traded in the market. FKLI plunge lower after KLCI was closed almost lowest upon end of trading sessions despite FKLI was manage to recover from weak opening as Dow Jones and regional indices were traded lower during trading sessions. FKLI penetrate previous support levels at 1290 upon open for trading but manage to recover swiftly at 1299 regions, 78.6% Fibonacci resistance levels before plunge lower before end of trading sessions. Technically, FKLI seems possible to further extent correction wave towards south provided resistance levels at 1299 and 1302.5 were not violated in the coming trading sessions. However, FKLI would seems temporary supported around support levels at 1290 and 1284 regions. FCPO June Futures contract traded RM42 higher as compare to previous trading sessions to close at RM2575 with a total of 8,911 lots traded in the market. FCPO price was traded lagged as it traded lower during 1st trading sessions before surge higher during 2nd trading sessions despite soybean oil and crude oil were traded firm during overnight trading while traded lower during electronic trading. FCPO price rebound sharply after failed to penetrate 123.6% Fibonacci support levels at RM2550 regions before manage to reach new high at RM2580 regions. 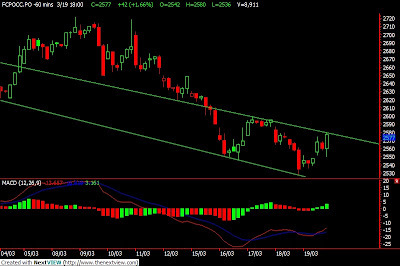 Technically, FCPO price seems trading within downtrend channel line that appear in the hourly price chart provided traded price must not penetrate resistance levels at RM2584 and RM2600 regions. Failure to trade below the resistance levels shall indicates strong rebound in the coming trading sessions while support levels at RM2550 and RM2530 shall trigger same message once failure to overcome the selling pressure. FKLI March Futures contract was traded marginally 1 point higher as compare to previous trading session to close at 1298 levels with a total of 5,138 lots traded in the market. FKLI manage to recover from losses after FKLI was plunge lower during trading sessions as most of the regional indices recovered from losses during 1st trading sessions. FKLI opened higher and attempted to challenge 61.8% Fibonacci resistance levels at 1304 regions before plunge lower to test 1293.5, 50% Fibonacci support levels. 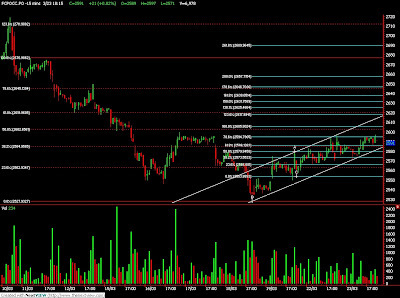 Technically, there are 2 possibility wave counts that indicate near end of short term downtrend where support levels at 1290 and 1284, both are 61.8% and 78.6% Fibonacci support levels must not be violated during trading sessions. 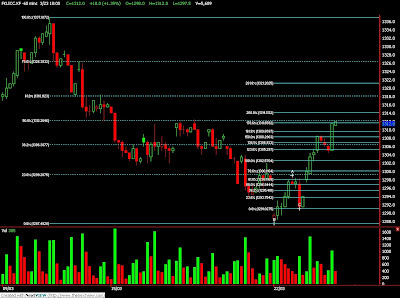 Failure to penetrate support levels shall trigger buying interest where resistance levels were seen at 1310.5 and 1327, both at 50% and 78.6% Fibonacci resistance levels.